General characteristics of Order Semaestomae: Mostly moderate to large in size. Corners of mouth drawn out into four gelatinous, frilly lobes (oral arms). Margine of bell usually has lappets but is not deeply scalloped into pedalia. 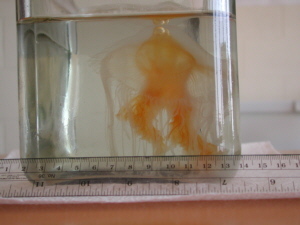 Tentacles on margin of bell contain extensions of the radial canals. Stomach has gastric filaments.